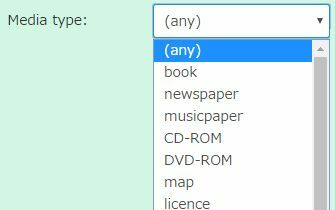 OPAC can search for "Local data base" (✽1) and "Various data bases" (✽2) . 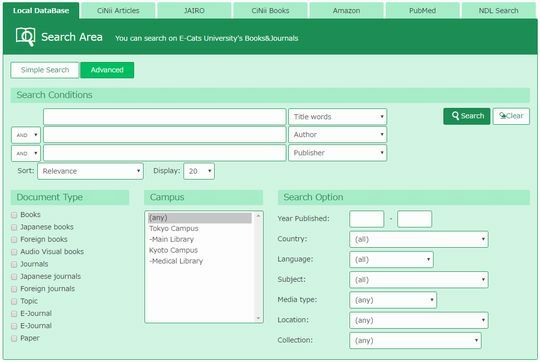 ✽1 Local Database is the online catalog databases of academic materials (books, serials and audio visuals) in the collections of your university. 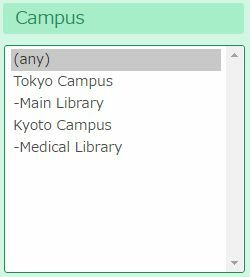 ✽2 Various data bases are accessible data bases to serve (CiNii Books･CiNii Article･JAIRO) of providing of National Institute of Informatics. It's explained about a simple search of a local data base. Please choose a database to use. Retrieval word is taken over to each data base. You can enter search terms to the frame. You can do a multiplication of search words. Please see here for input method. Click "Search" to begin the search. It returns to the initial state when clicking. When the link of KeyBoard is clicked, the keyboard will be displayed in a separate window. Search terms, you can enter on the keyboard. The simple search can be switched to the Advanced retrieval by pushing the link. When you click the top left of the logo, go to the top page. It's explained about a Advanced　search of a local data base. You can search by specifying the type of material. Since the decision of whether books or magazines is difficult material also, if there is no reason to narrow, it is recommended that you search without specifying. It is possible to retrieve it by specifying the owning pavilion (library and laboratory). You can search by selecting search items. You can search using logical operations. You can search by year of publication. You can search by specifying the publication of the country. 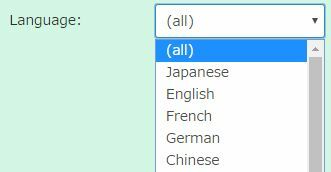 You can search by specifying the language. You can search by specifying the field. You can search by specifying the media type. You can search by specifying the Location. 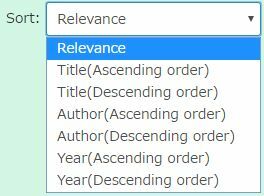 The retrieval result can be specified in the ascending order or the descending order. The maximum number of displays of the list a page can be specified. When the link of KeyBoard is clicked, the keyboard will be displayed in a separate window. Search terms, you can enter on the keyboard. The advanced search can be switched to the simple retrieval by pushing the link. It explains a detailed input method in the local data base retrieval. Can be typed in either upper case or lower case (such as abc, ABC, or Abc ). Please type full or partial title or series name. Various characters (✽) can be used. Please type full or partial author or editor name. The name of the westerner is input by an original spelling. When the translated book is published, it is likely to be able to retrieve it by Japanese Yomi. Please type the name of publisher. Please type subject. "Subject" is defined by some subject headings (BSH, NDLSH, MESH, LCSH, etc.). International Standard Book Number （ISBN） is a unique number to identify books. The hyphen "-" can be omitted. 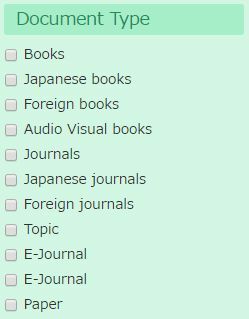 XISBN can be used here. International Standard Serial Number （ISSN） is a unique number to identify journals. XISSN can be used here. In the case of OPAC, it can refer to both "Classification Type: Classification Table Number", and the "Classification Table Number". The classification number of the owning book can be retrieved. The number in which Class number, Author symbol, and Vol. No. and number of books are matched can be retrieved. It is possible to retrieve it by bibliography ID given to the bibliography of a local data base. It is possible to retrieve it by the number given at the time of each school owning. ※ It is a bar code number pasted to the cover or the back cover etc. of material. The LC card number can be retrieved to eight digits by regularizing it by replacing the hyphen with 0. With National Diet Library Card Number (NDLCN) and National Diet Library Periodical Number (NDLPN), I can search it. You can search in the magazine name identification code. CODEN is the number that "American Society for Testing Materials" gives. In bibliography ID (NCID) of NACSIS-CAT, I can search it. It is possible to retrieve it by the number that National bibliography making organization　gave. Journal Code and, school unique number, you can search in a common code. When standard numbers other than ISBN, XISBN, ISSN, NBN, and NDLCN are registered in "Other codes", it is possible to retrieve it. When you input "* (asterisk)" to an end of retrieval word, and search, you can do a match search. Please input it without putting the space between the retrieval word and " * ". When the retrieval term like the above-mentioned example is input, "community" or "communication", etc. can be retrieved. Exact matching search can be done by typing "# ( pound sign )" at the beginning of the search terms. In the detail retrieval, when the following item is selected from the pull-down, the exact match search can be done. When search terms are typed like the above-mentioned example, only " beautiful life " that completely match the searched terms is searched. The partial matching search can be done by surrounding the search terms with a parenthesis. It is effective when retrieving it without dividing the retrieval word. In the detail retrieval, when the following item is selected from the pull-down, the partial match retrieval can be done. When search terms are typed like the above-mentioned example, all words that include with "Historical　dictionary", such as "Historical　dictionary　of　Tokyo" and "European　historical　dictionary　series" are searched. When search terms are typed to two or more items and "AND" is selected, materials that agree with both terms are searched. Material including word "beautiful" and "life" is searched. You can search like the above-mentioned by putting space between two words or putting "*". However, the title of a book (complete type) and the author name are excluded from it. ▼　Search to put "*" between the two words. ▼　When you search by typing space between two words. When search terms are typed to two or more items and "OR" is selected, materials that agree with either two search terms are searched. 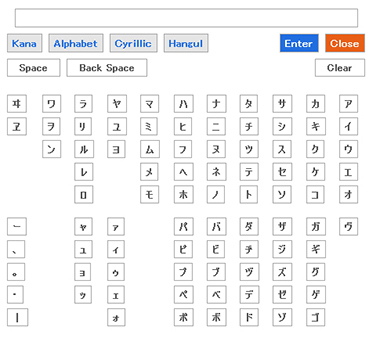 Material including word "Yosano" or "akiko" is searched. ▼　When it is separated by "+". When "NOT" is selected, materials including the second word are excluded though materials including the first word are searched. Materials including word "Bronte" are excluded though materials including word "Charlotte" are searched. ▼　When it is separated by "-".